Do you know that your aging loved one’s healthy diet can go a long way in ensuring that they also have healthy hair? 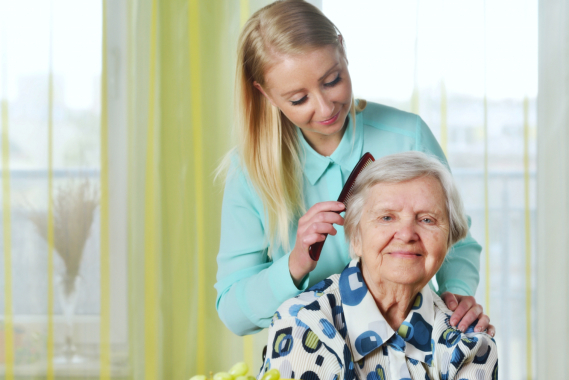 As the leading provider of Home Care in Orange Connecticut, you can call on us to help see to it that your aging family members are being served healthy meals every day, so that their well-being is healthy, including their hair. Get their hair trimmed approximately every other month. Regular trimming allows the hair to grow healthy and strong and help them make look thicker. Our providers of home care services in Orange Connecticut can then help your loved one in grooming themselves. Don’t use chemical treatments as it can contribute to a stiff and dry condition, which leads to easy breaks of the hair. These harmful hair treatments include dying, bleaching, and straightening. Avoid very hot showers, as this temperature can strip the hair of their natural and good oils. When you do need to take this type of bath, just make sure that your hair is being rinsed with the cooler water. When putting styling products on an older adult’s hair, stay from using products with stronghold as they usually contain alcohol, which is not healthy for your hair. Alcohol content in hairstyling products can cause hair brittleness. If you ever want to style your senior loved one’s hair, stay away from the aggressive techniques. While there are many techniques to choose from, these can potentially pull their hair out easily and unnecessarily and lead to more brittleness. After taking a bath, don’t wrap their hair up. Instead, blot their wet hair to dry them by using a towel. Make sure that you treat their hair gently when you dry them. Ensure that your loved one is also using hair oils and moisturizers that are not out of date. Make sure these products are always replenished. Also, mind the specific hair type of your loved one as each type has a different care style. The hair of your senior loved one continues to thin as they age. Hence, proper and adequate care has to be administered so they will not lose them unnecessarily. Let these tips help you out in caring for how they look every day. Our expert staff team providing companion care in Connecticut are also trained to extend overall personal care to our clients, including their grooming and dressing. When you’re not around to personally cater to these needs of your family member, don’t hesitate to keep in touch with us. At Amity Home Care, you can trust us to extend only the quality level of service that your loved one deserves. Do you want to receive regular updates about care services for your aging loved one at home? Follow Amity Home Care on our Facebook page. This entry was posted in senior care and tagged Hair Care Tips, Healthy Hair, Healthy Meals for Hair. Bookmark the permalink. Do you have any inquiries? Feel free to reach us through our social media sites and contact information provided below.